On December 16, in the Place Bell arena — Laval, Canada, a fight was held among middleweight boxers (up to 72.6 kg) — Antoine Douglas vs. Gary O’Sullivan. 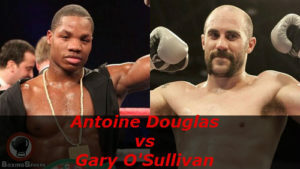 Antoine Douglas vs Gary O’Sullivan. The percentage of early victories Antoine Douglas KOs 67%. The percentage of early wins Gary O’Sullivan KOs 64%. The fight for the title of inter-continental champion in the version of Vacant WBO Inter-Continental in middleweight. Antoine Douglas is an American boxer in the middleweight division. On March 27, 2017 Douglas defeated Eduardo Mercedes to win the WBC FECARBOX middleweight title. On December 16, 2017 Douglas lost to Gary O’Sullivan. Gary «Spike» O’Sullivan is an Irish professional boxer who has formerly held the WBO International and Irish middleweight titles. He has also acted and has performed stunts in the 2007 film Strength and Honour. O’Sullivan is a member of Murphy’s Boxing, a boxing promotion founded by Ken Casey of the Boston punk band Dropkick Murphys. Win to TKO 7 for Gary O’Sullivan — Won vacant WBO Inter-Continental middleweight title. You can always find recordings of other fights in our Fight video.